We have all been there, we are in the middle of printing out something important when all of the sudden there is a paper jam. I think we can all agree that paper jams are the worst. 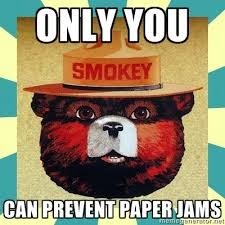 The good news is that paper jams can be avoided. Most paper jams are either caused by lack of machine maintenance or poor use and storage of paper. If you work in an office setting chances are you order printer paper in bulk. Printer paper should be stored in a cool and dry place. Humidity causes pages to stick together and jam when loaded into the machine for a print job. Also try to avoid mixing different brands and types of paper together. Although it is hard especially when you get to the end of a package of paper but, different companies manufacture paper differently and those slight differences are enough to throw off your printer mid printing process. Before feeding your paper onto your printers paper tray make sure that the tray is aligned properly for the size of your paper. Most printers have adjustable printer trays making it possible to print on a variety of paper sizes. If the tray is not adjusted properly your paper can feed crooked leading to a paper jam. Also do not over load your paper tray, try only loading enough paper onto the tray as needed for the current job. It will also help if you take a second to loosen the sheets before loading them into your printer. Shuffle them around to make sure none of the pages are stuck together. Keeping your printer clean by conducting regular maintenance will help to keep your paper jams to a minimum. Try to get into the practice of weekly cleansing. Residue from ink and toner can accumulate inside of your printer not only causing jams but also reducing the quality of your print jobs. Use a soft brush to gently wipe the inside of your printer to eliminate dust and residue build up. After a paper jam occurs it is a good idea to open your printer lid and inspect the inside of your printer. You will want to look for tiny pieces of paper stuck inside of your printer as a result of the jam. If these pieces are not removed they will cause future paper jams. If you don’t use your printer weekly or even daily it is a good rule of thumb to print something for the sake of keeping your toner running. This not only keeps the toner from becoming dry and causing jams, but also will ensure that when you do print a document it will be of the highest quality. When a paper jam does occur make a note of it. Pay attention to how big the print job was, what type and brand of paper was being used as well as the papers size. Over time you might be able to notice a pattern and realize and underlying issue causing the jams. Do you have any questions about printer maintenance? Need more advice on how to avoid paper jams? Ask us in the comments below we would be glad to answer your questions!